Another summer vacation is drawing to a close as a new school year starts. My son will be entering first grade…that seems significantly more mature than kindergarten, doesn’t it? No naps, less time on the playground, and the introduction of standardized testing with little bubbles to fill in with #2 pencils. This also means longer days, a bigger appetite, and a good lunch. Studies now show that the food our kids consume isn’t just fuel to give them energy. The choices that students (or their parents) make affect concentration, behavior, and overall health too. With “childhood obesity” becoming a hot topic of conversation as it continues to affect more of our children. We all need to consider what we’re putting in our kids’ lunches and how it will affect them. Take advantage of any opportunities you have to teach them to eat better but monitor the choices they make. Too much freedom in the lunch room can often yield less than nutritious consequences. When I first began to consider my school lunches in junior high, I saw them as a “tide-me-over” until dinner option. I didn’t worry about the choices I made because I was more concerned with the “real meals” of breakfast and dinner. After all, everyone knows that breakfast is the most important meal of the day, right? Dinner (or supper) was a family meal around the table in my house (unless our schedule got carried away, as usual). 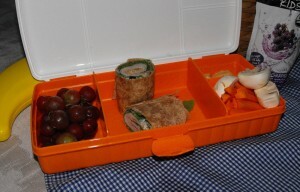 Lunch, however, often came in a brown paper bag- with lots of disposable pieces which only supporting my mental picture that lunch was after all a throw away meal. As a mother, I now go out of my way to make certain that my son (and husband too) are both dining on options that include fresh fruits and vegetables, protein, and whole grains. Though initially this can seem a little challenging, with practice and routine this does get easier and it is well worth the investment. You can visit http://www.mypyrmid.gov/ to see what the USDA’s recommended daily allowances for each family member are. This is important, especially for kids since their requirements can vary greatly from adults’. Start teaching your kids now to read labels and pay attention to what is going into their body. Preservatives like nitrates are often found in deli meats so be certain that you read your label and are aware. Try to avoid these ingredients whenever possible. Also watch your sodium intake since these foods can be heavily salted. Eat whole grains whenever possible. You will really need to pay attention to the labels with this — many products call themselves “whole wheat” but they have refined flour instead of whole wheat flour listed as the primary ingredient. Wheat tortillas are an excellent example, I normally have to make them myself or go to the health food stores to find them with whole grain flour. Crackers are also normally full of simple carbohydrates, but with careful scrutiny you can find whole grain crackers too. If your kids are very picky, work on this. I recommend reading “Green Eggs n’ Ham” with them. In the meantime, have them help choose fresh options from the produce department. Encourage them to try new flavors but also try to guide them with things that are at the peak of their season for best flavor. Dips can be an excellent source of encouragement for kids that think they just don’t want to try something new. Create your own healthier dips by combining plain yogurt and herbs to dip veggies in, or yogurt and honey for fruit. Arranging the fruit/veggies on a skewer as a kebab can also work wonders at encouraging kids to eat. If you do this though, trim off the sharp point on the skewer…you don’t want lunch to end up being dangerous! 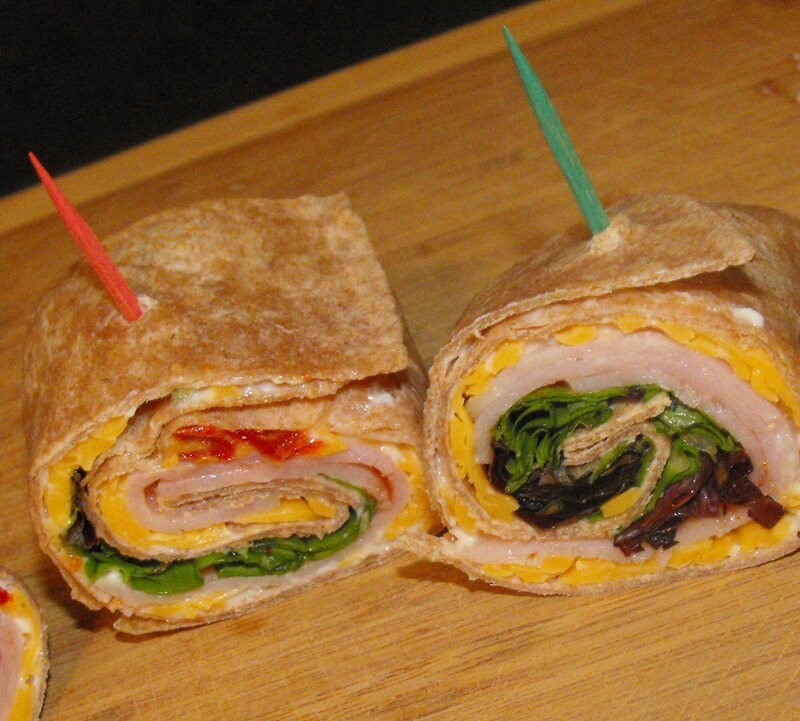 Sandwiches made with tortillas and pitas are a big hit with kids! My kids love these. Neither one of my kids would normally consciously request lettuce on a sandwich. With the roll up, however, the lettuce just blends right in and they don’t even notice. 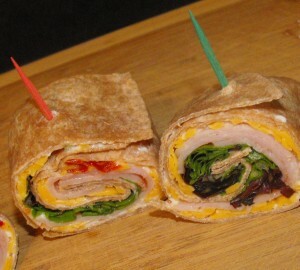 Spread tortilla with mayonnaise, top with turkey and remaining ingredients. Secure with a toothpick and slice to desired serving sizes. Serves 2. I prefer to grate my own cheese when preparing dishes that call for it. The fresh grated cheese is not coated with the “anti caking agents” that they apply in the factory to keep it from sticking together. I think this helps you to taste more of the cheese flavor and you can use less of the other condiments that you normally apply to glue everything together. Cut pita in half to form 2 pockets. Mix together Mayonnaise, bbq sauce, and prepared horseradish (if using). Spread some of the sauce mixture in each of the pockets and top with half of the remaining ingredients. Serves 2.